I knew once I created a challenge for myself (see entry about pinterest) I would fall a little short. A work in progress I say!!! and say and say. 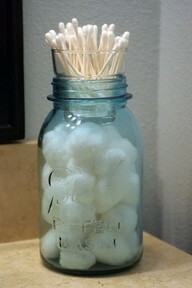 Well on Pinterest the other day I saw this cute idea for cotton balls and q-tips. Below is the picture I found on pinterest itself. So I rummaged through the condo and found something very similar. And Ta-DA. My very own holder, tingy-bobby.